Obama: 'We Are Not Doomed To Endless Gridlock' : The Two-Way President Obama ended a busy day in Washington with a news conference at the Eisenhower Executive Office Building next to the White House. President Obama used a news conference this afternoon to make the case that the post-election lame-duck session of Congress that just ended was the most productive in decades. President Obama during his news conference Wednesday. Hailing the ratification of the New START missile agreement with Russia, the repeal of the military's "don't ask, don't tell" policy, the passage of a tax cut and unemployment insurance package, and other accomplishments, Obama declared that they prove "we are not doomed to endless gridlock." We "live-blogged" during the news conference. Scroll down to see how it played out. Update at 4:50 p.m. ET: The president is asked about another piece of unfinished business -- his pledge to close the U.S. detention center at Guantanamo Bay, Cuba. "My number one priority is keeping the American people safe," he begins. And one way to keep Americans safe is to not provide "al-Qaida and jihadists (with) recruiting tools for fledgling terrorists." Guantanamo, he says, is "probably the number one recruiting tool" for terrorists around the world. But, he continues, the U.S. can't "simply" release people "who could do us great harm." He's aiming, Obama says, to strike a balance between security and the values embedded in the Constitution. And that was the last question. Update at 4:45 p.m. ET: Staying on the subject of immigration, the president says that he hopes one thing Americans have seen during the lame-duck session of Congress is that "I am persistent. If I believe in something strongly, I stay on it." Update at 4:44 p.m. ET: Obama is asked about his promise to reform immigration -- one that that hasn't been accomplished. One of his biggest regrets, Obama says, is that the DREAM Act (which would put some young people on the path to citizenship) hasn't been passed. "That can't be who we are," Obama says of denying a path to citizenship for young people who came to the U.S. "through no fault of their own" and want to serve the nation. "My administration is determined to get immigration reform done," the president adds. Of Republicans, he says, "some of them in their heart of hearts know it (the DREAM Act) is the right thing to do." Update at 4:35 p.m. ET: Though he struck a deal with Republicans to extend tax cuts for the nation's wealthiest people as well as everyone else, Obama says he still believes it's not wise to give the super-rich such advantages when budget deficits are soaring. "They will still be rich if those tax cuts went away," he says. Update at 4:32 p.m. ET: During this year's campaign, Obama often said that Republicans' ideas would put the economy into "reverse." He's asked about where things stand now and his relations with the GOP. "We are past the crisis point" in the economy, he begins. "But we now have to pivot" to focus on creating jobs. It's the American people, he adds, who will "drive" the car and determine which party's policies are really working. And, says Obama, he thinks newly empowered Republicans realize that "with greater power comes greater responsibility." Update at 4:29 p.m. ET: Is it inconsistent to support repeal of "don't ask, don't tell" and oppose allowing gay couples to marry, the president is asked. "My feelings about this are constantly evolving. I struggle with this," Obama says. "My baseline is a strong civil union" that provides gays with protections and rights. "But I recognize from their perspective that this is not enough." He will "continue to wrestle" with the issue. Update at 4:24 p.m. 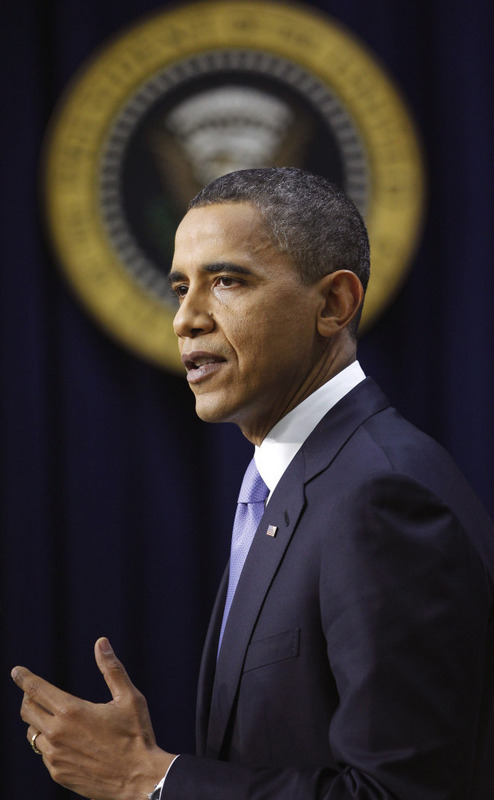 ET: Is he the new "comeback kid," Obama is asked. The things that have gotten done in recent weeks (tax cuts, New START, repealing "don't ask, don't tell") were "not a victory for me, it's a victory for the American people," the president says. Update at 4:23 p.m. ET: The accomplishments in Washington the past few weeks, Obama says, prove "we are not doomed to endless gridlock." Update at 4:20 p.m. ET: Continuing his opening remarks, the president hails the "package of tax cuts" and unemployment insurance, the repeal of "don't ask, don't tell," and the passage of new food safety regulations. He calls on the House to follow the Senate's lead and pass legislation to help 9/11 first responders pay their health care costs. The lame-duck session of Congress, Obama says, has been "the most productive post-election period we've had in decades." Update at 4:19 p.m. ET: The New START missile reduction pact with Russia, Obama says, enhances the United States' standing in the world on the issue of nuclear proliferation. Update at 4:17 p.m. ET: The president just came to the podium. "I just wanted to say a few words about the progress we've made on some key issues," he starts. "It has been a season of progress for the American people." Update at 4:13 p.m. ET: The White House just tweeted that the news conference will look "back at lame duck, ahead to future." Update at 4:11 p.m. ET: Though we hope you follow along with us, there are obviously many ways to monitor the news conference, including the White House's webcast. Update at 4:09 p.m. ET: On the air, NPR's David Welna just noted that 13 Republican senators today joined all the Democrats in the chamber to approve the New START missile reduction treaty with Russia -- an unusually bipartisan tally. Update at 4:01 p.m. ET: NPR's coverage is streaming. If you click on "LISTEN NOW" a player should pop up. At this moment, you'll hear the top-of-the-hour newscast. In a few minutes, NPR's Paul Brown will be on to host the pre- and post-news conference analyses. President Obama is ending a busy day in Washington with a news conference at the Eisenhower Executive Office Building next to the White House. It's scheduled to get going at 4:15 p.m. ET. This morning, he signed legislation to repeal the "don't ask, don't tell" policy that has barred openly gay men and women from serving in the military. This afternoon, he saw the Senate ratify the New START missile reduction agreement with Russia. Last Friday, Obama signed into law the tax deal he reached with Congressional Republicans. So there's plenty the president will want to talk about.